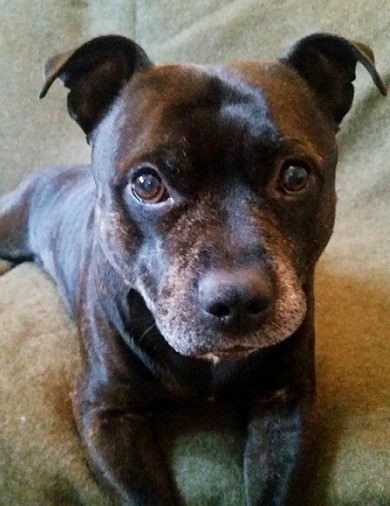 This cute little boy is Tucker, a 9-10 year old Staffordshire Bull Terrier. 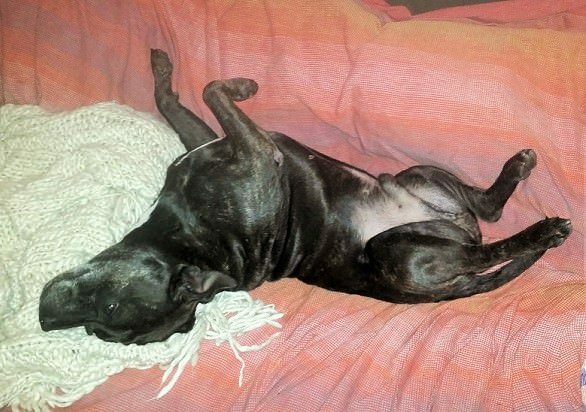 He’s in an Oldies Club foster home in Bristol while he waits for a permanent home. Tucker needs a home where he can be with someone most of the time. His foster carer is gradually getting him used to being alone for a short time but leaves him with a friend when she has to go out to do boring human things. Actually, Tucker loves all other dogs but they sometimes find him a bit boisterous. It doesn’t occur to him that other dogs might find him alarming or annoying. He’ll bound right up to them and try to play! He calms down quite quickly after some hello sniffing. He was very good when another dog came to visit and he’d probably love living with other dogs. Tucker hasn’t been cat tested but doesn’t show much prey drive with small furries in the park. 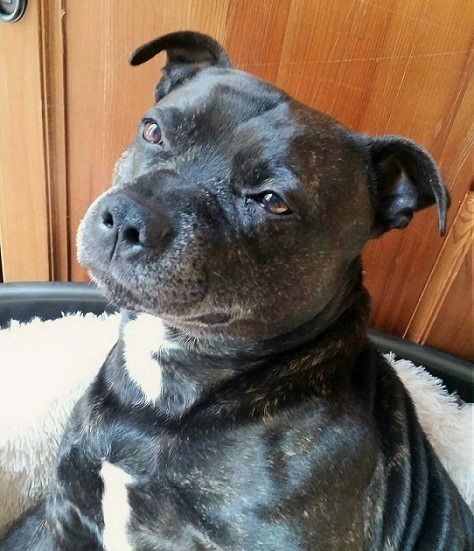 Tucker is too excitable to live with children because he loves people so much! He can get carried away when playing and sometimes be a bit mouthy. His foster carer is training him out of this habit and he’s taken to that training very well. He walks past children calmly when out on walks but in the home, he’ll always be too bombastic for anyone under 15. At the moment, Tucker has two half hour walks a day or one longer one. He would gladly do more though! Anytime you want a stroll, he’ll be right there with you and he’ll still have plenty of energy for play time! There’s a long list of things Tucker loves… belly rubs, back rubs, neck scratches, snuggling, rolling around, meeting new people and dogs, walks, exploring, playing tug of war and (probably the most funny to watch) he loves catching the water from the shower head in his mouth! Tucker’s dislikes are spray bottles, being picked up and being left alone. An active household where someone will be with him most of the time. He’s very sociable, so having more than one person or plenty of visitors would be nice for him. He’d like to live with another dog(s) or at least be able to meet and play with some. A garden for charging about in would be good and he will need some grass to roll in, of course! Tucker is neutered, vaccinated and worm/flea treated. He did have a dry, itchy skin problem but it’s now completely cleared up. His back legs can be a bit stiff sometimes, after he’s been lying down.